Occurrence or incident regarded as fore-shadowing a favorable or unfavorable issue in a certain conjuncture. The belief in prognostic signs is closely connected with Divination and mantic, from which it is distinguished, however, in that it presupposes neither higher inspiration nor special knowledge. The principal characteristic of the omen is the fortuitousness of the phenomenon or of the event, which otherwise need be in no way remarkable. Usually it is even a commonplace occurrence. The belief in omens, in the more accurate acceptation of the term, is the most primitive stage of divination and soothsaying. Studying the signs of the heavens (Astrology) and predicting from the flight of birds (Augury) or from other circumstances (Divination), were prohibited by Judaism. But this superstition was so deep-rooted that, in a form in which it did not betray its connection with idolatry and magic, it was practised in the time of the Talmud, and it is tolerated even at the present time. The best-known examples from the Bible are the signs accepted by Eliezer (Gen. xxiv. 14) and by Jonathan (I Sam. xiv. 9), which the Talmud declared to be simple omens. "As his name, so is he; Nabal [= "disgrace"] is his name, and folly is with him" (I Sam. xxv. 25), suggests the "nomen et omen." A man by the name of Kidor was distrusted by R. Meïr (about 150 C.E.) because in Deut. xxxii. 20 occur the words, "For a generation ["ki dor"] of perversity are they." Name-superstition was wide-spread, although many sought to combat it (Yoma 83b). Even the Sibylline Books (iii. 224 et seq.) already declared the signs of sneezing, the flight of birds, etc., to be illusory (comp. Josephus, "Ant." xix. 8, § 2; Blau, "Das Altjüdische Zauberwesen," p. 164). As examples of sentences which, in accordance with the Biblical prohibition of divination ( ; Deut. xviii. 10; comp. Lev. xix. 26), it is forbidden to regard as ominous, the following are quoted: "The bread fell from my mouth"; "My staff fell from my hand"; "A snake crept to my right"; "A fox ran to my left and his tail blocked the road in front of me" (Sifre, Deut. 171). The Babylonians took omens from weasels and snakes, references to which occur in the Talmud (Blau, ib. p. 45), and Winckler is probably not wrong in maintaining ("Alte Orient," iii., parts ii. and iii., p. 41) that the oldest form of the sibyl was modeled after the pattern of the Babylonian collections of omens. Omens are divided into two main groups—good and bad omens. 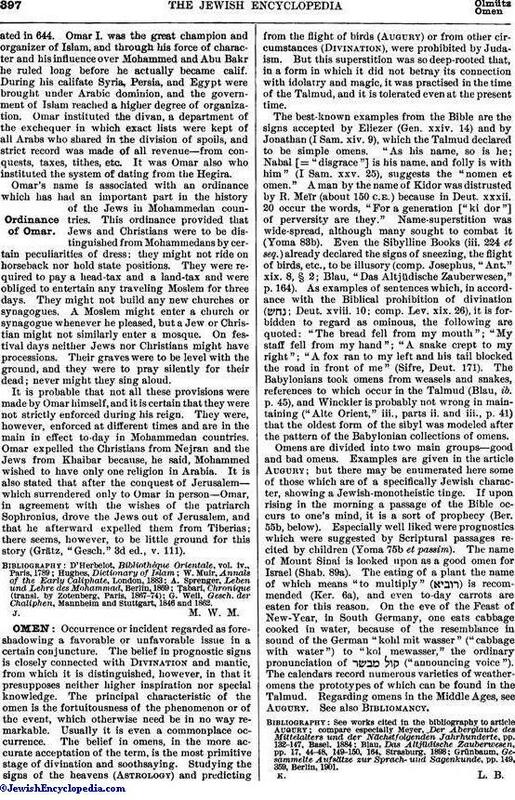 Examples are given in the article Augury; but there may be enumerated here some of those which are of a specifically Jewish character, showing a Jewish-monotheistic tinge. If upon rising in the morning a passage of the Bible occurs to one's mind, it is a sort of prophecy (Ber. 55b, below). Especially well liked were prognostics which were suggested by Scriptural passages recited by children (Yoma 75b et passim). The name of Mount Sinai is looked upon as a good omen for Israel (Shab. 89a). The eating of a plant the name of which means "to multiply" ( ) is recommended (Ker. 6a), and even to-day carrots are eaten for this reason. On the eve of the Feast of New-Year, in South Germany, one eats cabbage cooked in water, because of the resemblance in sound of the German "kohl mit wasser" ("cabbage with water") to "kol mewasser," the ordinary pronunciation of ("announcing voice"). The calendars record numerous varieties of weather-omens the prototypes of which can be found in the Talmud. Regarding omens in the Middle Ages, see Augury. See also Bibliomancy. Grünbaum, Gesammelte Aufsätze zur Sprach- und Sagenkunde, pp. 149, 359, Berlin, 1901.